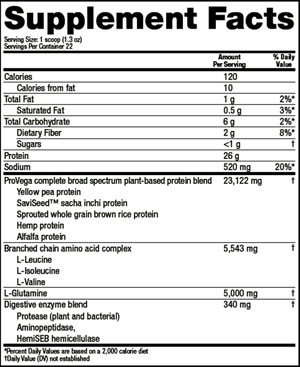 The recent innovation to Vega Sport Performance Protein comes from the addition of SaviSeed (sacha inchi) protein, a rich, plant-based source of the amino acid tryptophan. Tryptophan is a key component of serotonin production(1). Serotonin—the feel good hormone—helps with the mental aspect of recovery, so you’ll keep the drive alive and be motivated to train again. 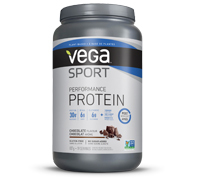 Take Vega Sport Performance Protein within 30 to 90 minutes of your workout or throughout the day to meet your individual protein needs to recharge and repair so you can do it all again, sooner. For optimal results, use in conjunction with Vega Sport Recovery Accelerator. Mix 1 scoop of Vega Sport Protein in 1 cup (250 ml) of water and drink whenever you normally use protein, and can be taken one or more times daily. OTHER INGREDIENTS: Natural French vanilla flavor, stevia extract, sodium chloride.